Social media is an essential part of any successful real estate business. It is one of the most powerful ways to build your brand awareness, stay in front of your prospects and customers, and attract new leads. However, there is a certain science to social media marketing; especially within the real estate industry. Although many of you know and understand that you are supposed to be using social media (on a daily basis), many of your either fail to do it, or are actually posting things that will never make you money. While it is important to be "present" on social media, the whole point is for it to actually make you money - right? If you are like many of my clients, you are probably making one or more of the following social media mistakes and your business is paying the price. By the way - it's okay to make mistakes, we all do! It's especially okay when you've got The Real Estate Writer here to watch your back. 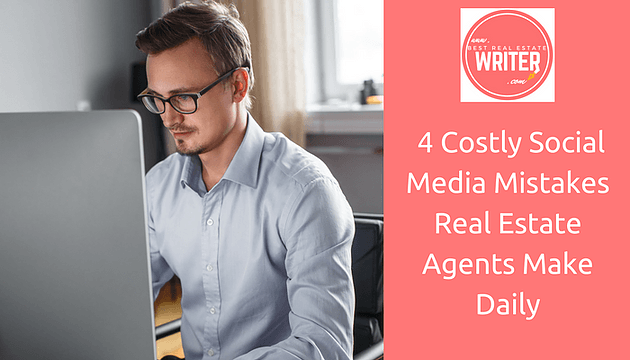 So without further adieu here are the four most expensive social media mistakes for real estate agents and some tips on how to correct them. Content is created and marketed with the sole purpose of attracting and collecting valuable leads. Therefore, if you are pushing other people's content on your prospects and customers, you are actually pushing them away! It is as though you are saying "Here is some valuable information that I don't know enough about to create on my own, but check out this guy who does." Is that the kind of message you want to put out there for your prospects, customers, and referral sources? I didn't think so. Instead you should be constantly and consistently creating content in the form of articles, videos, pictures, etc. and sharing them on social media platforms in their proper formatting. Hashtags are one of the most overlooked and misunderstood components to social media. Every time that you post to Twitter, Instagram, etc. you should be including a set of relevant hashtags that will get your post in front of the right people. Remember, it is not about how many people are following you, it is about who is following you. By using strategic hashtags (posted in the comments section), you can dramatically increase the number of prospects that see your content. Want to save yourself a lot of time? Put together a list of about 20 relevant hashtags and save them as a note in your phone so that you can easily copy/paste them in every post in just seconds. If you are like many savvy agents, you are likely spending at least a little bit of your marketing budget every year to promote certain posts through social platforms like Facebook. In most cases, this will be a post advertising a listing or an open house that you may have coming up. What you are probably failing to do, is taking the time to properly analyze the results of those paid campaigns and apply what you've observed to future campaigns. This is by far one of the most expensive mistakes that you can possibly make with social media, direct mail, or any advertising campaign. Pay attention to the demographics of the people that are (and are not) responding to your ads. What is making them respond? As you move forward developing your content marketing calendar and composing future social media campaigns, be sure to use those prior campaign metrics to boost results. The metrics generated from each campaign are among the most valuable tools that you have for growing your real estate brand and your business. One of the most common marketing mistakes I see with real estate agents is that they waste their time and money on creating and promoting content that is irrelevant to their brand. When developing your content marketing calendar, make sure that you are centering your titles around your niche. Each article should be developed with the purpose of solving a problem or providing some type of value to your niche clientele and then closing them in with a well-structured call to action (CTA). For example, if your niche is working with luxury waterfront properties, you shouldn't be creating content that will appeal to first-time home buyers. Instead, you should be writing titles like "How-To Sell Your [insert city] Waterfront Property in 30 Days or Less" or "13 Reasons Why Living On Lake [insert name] Leads Better Life". Keeping all of your content focused around your niche will significantly increase your return on investment. Social Media should be one of the primary focuses of your business. The content that you create and market on social media today, will work for you forever if you do it correctly. This is a very exciting and lucrative time to be marketing your real estate business on social media.